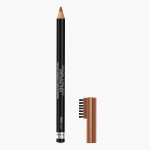 Perfectly defined eyebrows are now at hand with this admirable pencil. It comes with an inbuilt brush for effortless styling. The subtle shade provides a naturally exquisite look.